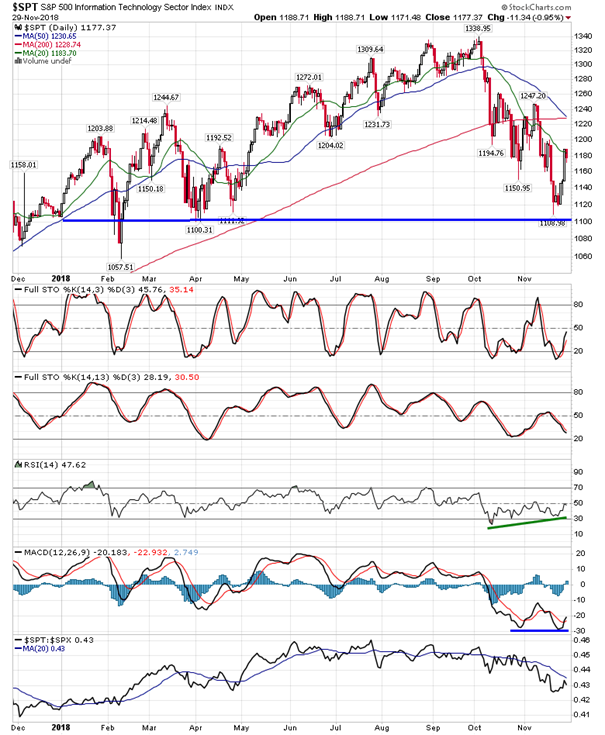 Are jobless claims providing another leading indication of a slowing economy? 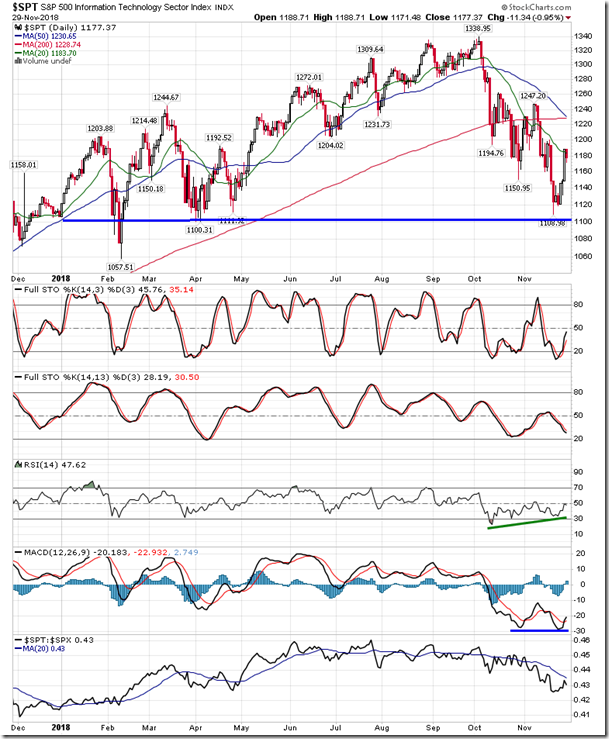 Stocks closed just below the flat-line on Thursday as investors position ahead of month-end and the catalyst presented over the weekend by way of the G20 meeting. 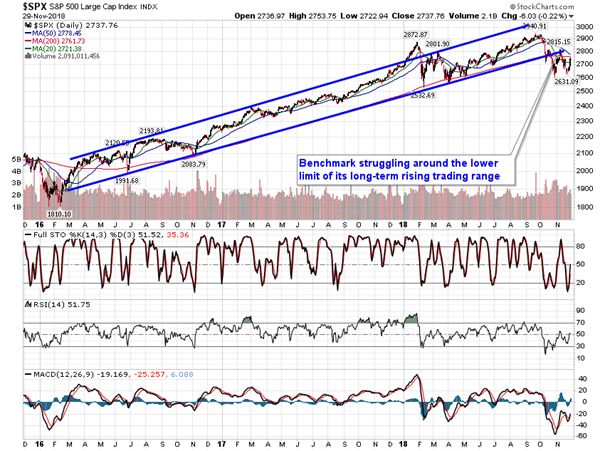 The S&P 500 Index shed two-tenths of one percent, trading between its 20 and 200-day moving averages, essentially marking the battleground for the pivotal event ahead. 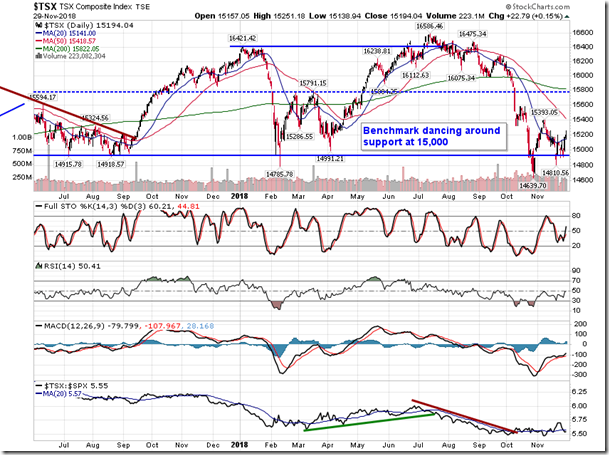 Technology once again took the role of the laggard on the day as investors express their scepticism that trade tensions will be alleviated with the weekend meeting between the leaders from the US and China. 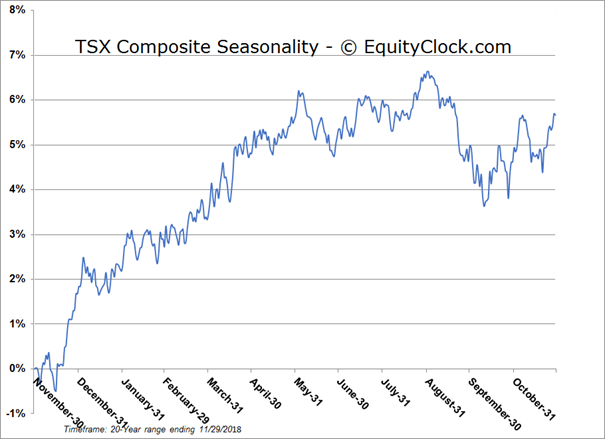 The Technology sector index is lower by 3.15% in November with just one session left in the period, certainly an abnormal result for a month that has seen the sector average a gain of 2.2% and realize positive results in 70% of periods. 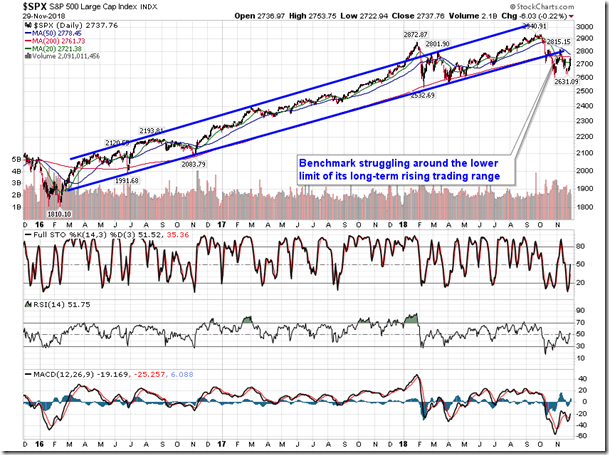 Momentum indicators for the technology benchmark remain in bearish territory, although slight indications that selling pressures are waning have become apparent. 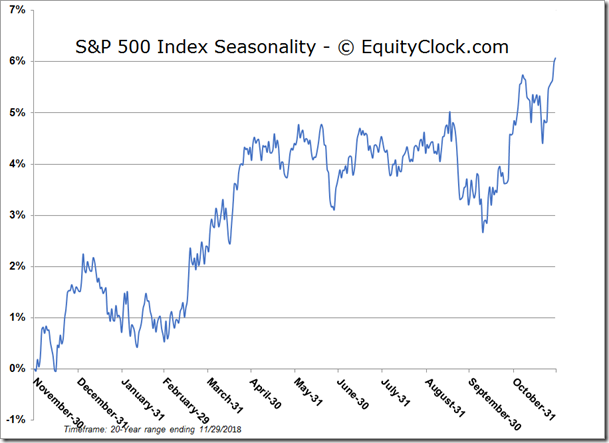 We are busy putting the finishing touches on our Monthly Outlook for December, detailing the areas of the market to look out for in the month ahead, as well as the tendencies that influence stocks in this final month of the year. Want a copy? 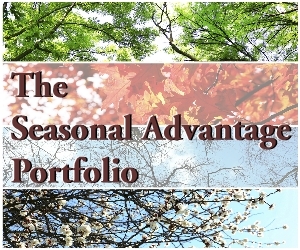 Simply subscribe to the Seasonal Chart Database at https://charts.equityclock.com/subscribe and we’ll send it right to your inbox. 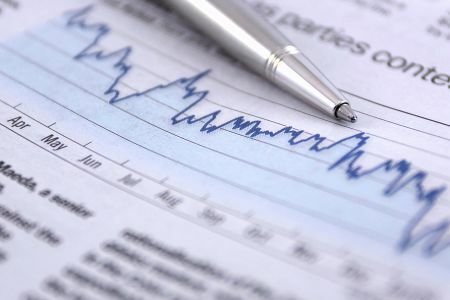 On the economic front, weekly initial jobless claims continued to show gains last week, rising by 10,000 to 234,000. 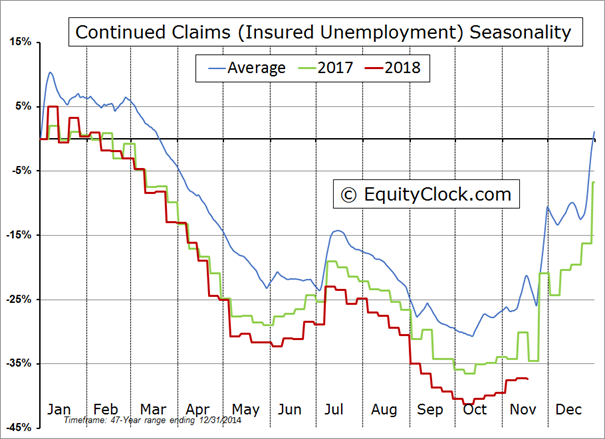 Initial claims hit a seasonally adjusted low of 202,000 in September and have moved gradually higher since, leading some to conclude that this is another leading indication of a slowdown in the economy. 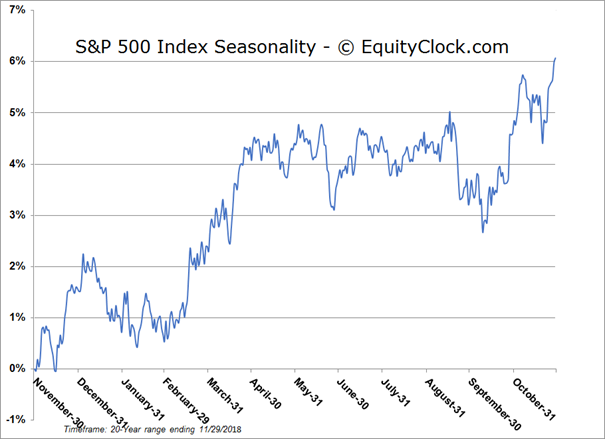 But a look at the non-seasonally adjusted data does not confirm the rise in this indicator beyond seasonal norms. 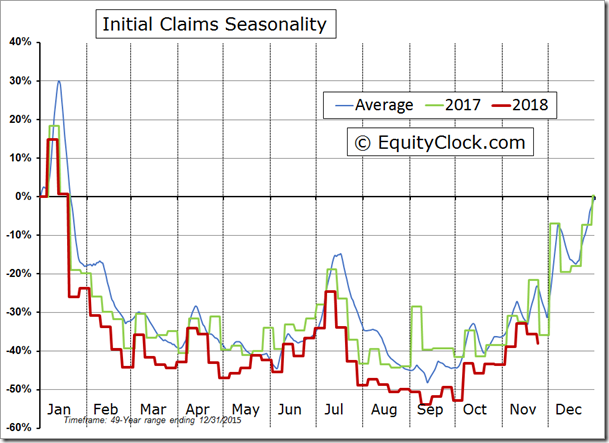 Initial claims have indeed risen in the past couple of months, but this is inline with seasonal norms for this time of year. The year-to-date change in the claimant count remains 14.5% below the seasonal average trend, representing the best performance since 1983! Continuing claims are showing the same, trending well below average into the month of November. 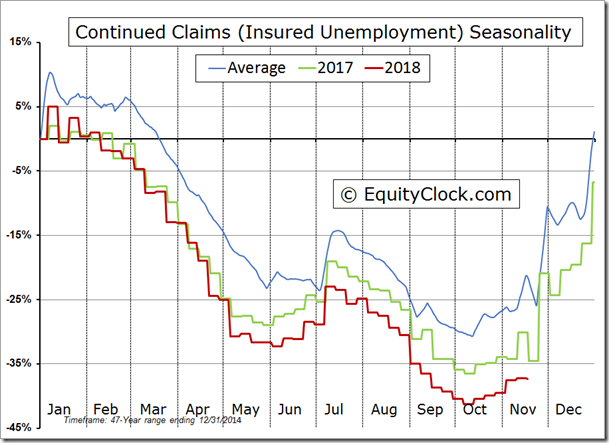 Typically in the run-up to a recession, jobless claims will start to rise above average as workers are laid off, but this is clearly not presently the case. 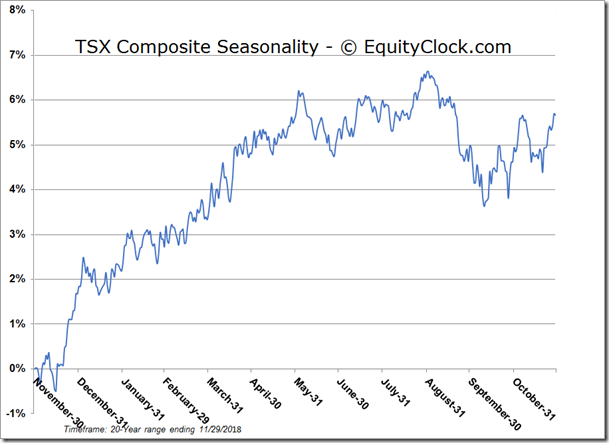 The rise in claims in recent weeks, which arguably have not been appropriately reflected in the seasonally adjusted data, is completely normal. The claimant count peaks, on average, in the month of January. 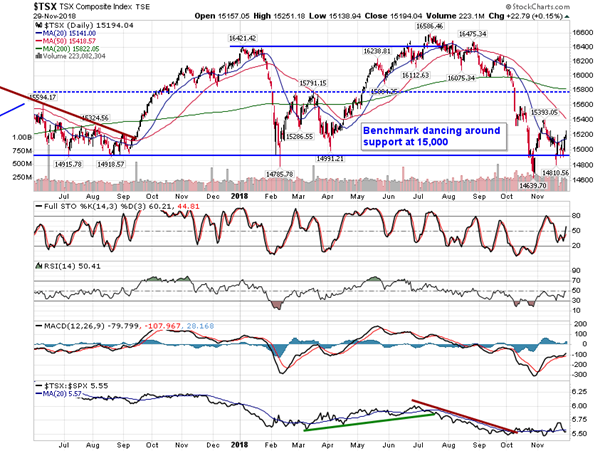 Sentiment on Thursday, as gauged by the put-call ratio, ended bullish at 0.90.